Two years ago, the landmark U.S. Supreme Court decision guaranteeing marriage equality was hailed as a major victory for the rights of lesbian, gay, bisexual and transgender people. The White House was illuminated in rainbow colors, and celebrations were held on city streets, in front of courthouses and in homes and churches throughout the country. 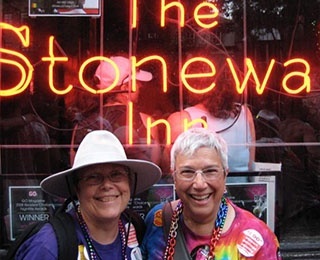 On the Sunday after the June 26, 2015, decision, Ardith Hayes and Ruth Ann Clark gathered in a circle at Trinity Cathedral in downtown Cleveland with other gay couples. All received a special blessing. The couple, who have been together more than 37 years, were married in California in 2008 and moved to Kendal at Oberlin in 2011. On the day of the decision, Ardith and Ruth Ann celebrated at Kendal with gay and heterosexual residents and talked about the importance of the court ruling. “Living at Kendal has brought acceptance and affirmation of our relationship as we’ve entered into community life. There has been no question that we are welcome here as we are, which was clear to us from the beginning when residents Robert Taylor and Ted Nowick reached out to us even before we came. “While the love we share has been paramount, it has mattered also that our civil rights to be married were honored – a reality that has been long in coming. We came from Illinois, where our marriage became valid, to Ohio, where our marriage was in violation of the state Constitution. June is Lesbian, Gay, Bisexual and Transgender Pride Month and is a time for both celebration and reflection. Kendal couple Nancy Lombardi and Ann Francis are doing both. “We’ll probably go to the Cleveland Gay Pride march. We used to go to pride marches in Lansing, Michigan, and marched in New York on the 25th anniversary of Stonewall,” Nancy says. Nancy and Ann have been partners for 35 years and decided there was no reason to get married just because the Supreme Court made it legal. “Our friends with children got married as soon as they could,” Nancy says. Since the decision, the couple is both encouraged and troubled by what is happening in the United States. “I think a lot of older people are becoming more comfortable, but I worry about transgender young people,” Ann says. When the couple was looking for a place to retire, finding a community supportive of gay rights was “very high” on their list. They moved to Kendal in May 2015, and a month later drove with Ardith and Ruth Ann to participate in the special blessing at Trinity for gay couples. They have found both the retirement community and city of Oberlin “open and accepting.” The couple sometimes attends a monthly Queer Happy Hour in an Oberlin restaurant, and they support the Lorain County LGBTQ+Task Force. Since graduating from Oberlin College in 1968, Dwight Call has worked and traveled all over the world. He directed study abroad in Japan, Geneva and Cameroon, worked on Sioux reservations in South Dakota and, before retiring in 2013, directed International Education at Georgia College in Milledgeville, Georgia. “I knew Oberlin was a very accepting place. When I was a student, I was not aware of the gay culture, but it was here,” Dwight says. Even in “conservative pockets” such as central Georgia, Dwight senses a growing acceptance of gays and lesbians. “I think transgender is still more problematic in terms of acceptance,” Dwight says. He talked about an international student from Central Africa he met at Georgia College. She was a female, struggled with her gender, tried to commit suicide, dropped out of school and has now written a book about becoming a male. “I don't understand that you can be born with one body and know you are the other gender, but I accept it," he says, "because I believe that everyone tells what is true for themselves." As more people get to know transgender men and women, he expects greater acceptance, like what has happened with gay and lesbian people. Our language may have to change too, he says. Instead of using “he” or “she,” some people prefer to be identified by the gender-neutral pronoun “they,” which was recently added to the Associated Press Stylebook that journalists follow. For more information about Kendal at Oberlin, call 800-548-9469 or 440-775-0094 or visit us online.